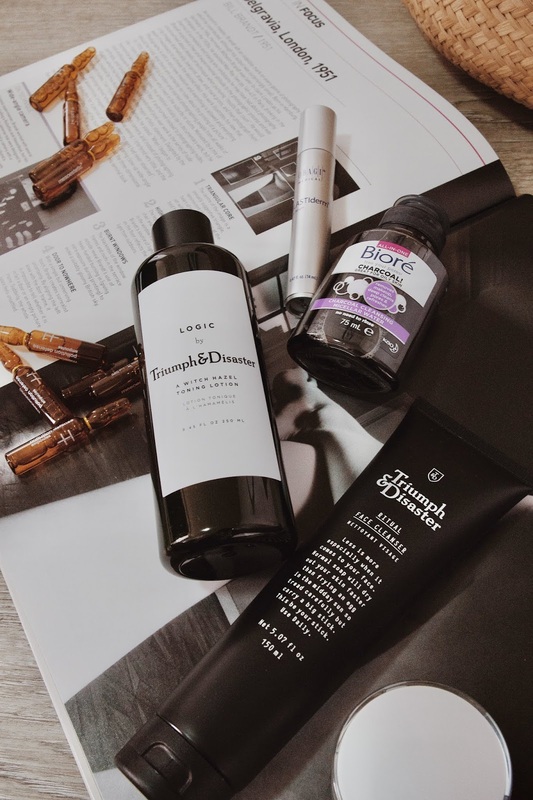 We all know I've been pretty slack on the blogging front lately, which means a bunch of products have been piling up in my spare room waiting for me to share them with you - so grab a drink and snack because I've got a whole lot of products to talk about today. My current skincare approach has definitely become a 'less is more' type routine. With my oiler skin, especially when I was a teenager, I use to overload with products, but as my skin has begun to even out such heavy routines really aren't necessary anymore - so having a few good key products on hand is perfect for me now. Something like this face cleanser from Triumph & Disaster is spot on for what I need right now. The formula is quite creamy and it feels really soft and refreshing to rub on your face. The scent is quite minty (reminds me of a mint slice, yum! ), and I love using this in the morning to help wake me up. This product has been formulated with Tamanu oil, Peppermint oil, Willow bark extract and Bentonite clay and is alcohol free to make sure your skin isn't left feeling dry. I always follow with a toner after I cleanse my face, and it can also be a great way to refresh your face throughout the day (if you're having a makeup free day of course). Another awesome alcohol free product, this toner contains Witch Hazel (which is known for helping to fight acne and blemishes), Tasmanian Pepper Fruit Extract which helps to calm and sooth your skin and Alpine Willow Herb Extract to help clean and reduce your pores. I've avoided witch hazel products in the past simply due to not being able to stand the smell, but I can confirm smell is not a problem with this product, in fact it pretty much has no scent. The combination of ingredients also brings a really refreshing feeling to my skin just like the cleanser. If you're looking for some great quality skincare products for a simple and easy routine, I can't recommend this brand enough - the products can sit on the pricey side, but your skin is certainly worth the investment and when you don't need many to help keep it looking fresh, what is there to lose. Speaking of investing in your skin, this product from mesoestetic also sits on the more expensive side. These pollution defines ampoules are used in the same way you would a serum however you only need to apply of a morning. The concentrated formula helps with anti-aging by providing your skin with hydration and protecting it against environmental pollutants (hence the name). The box also contains tools to help you store the rest of the product once you open one of the capsules. I found the formula to be a tad oiler than some serums (but only just a tad so I could still use it) and it has quite a mild, clean scent which I found pleasant. Another regular brand I feature on my blog recently sent me the two products from their Elastiderm range to try out - I can't go without eye creams and serums so these were right up my alley. This serum is applied with a roller, which I always love using because they also cool your eye under which can help immensely with any puffiness. An easy to apply serum with no scent and I found it dries almost instantly. The serum contains a bi-mineral complex and malonic acid which will help smooth and firm the skin under your eyes, as well as caffeine (which I've begun to notice in a lot more eye products lately) which aims to also help reduce puffiness. I find this serum is better for day use, while the cream is thicker and great to use a night so that while you sleep the skin can soak up all the goodness - plus a lighter formula works better if you're applying make up for the day. As I mentioned, I prefer to use this product at night due to the thicker consistency compared to the serum. This is much more like a moisturiser and doesn't sink in as fast as the serum, but it will leave your skin feeling super, super soft! This product has the same properties as the serum expect without the caffeine. Ya'll know I'm a big fan of Biore, so when two of their products arrived in the mail I was pretty excited. Biore have just released two new micellar waters which complement two cleaners they already have. The first is the charcoal micellar water which is particularly good for oily skin. The charcoal helps to absorb any excess oils and reduce shine to help give you a matte finish - great for use just before applying makeup. The other new product is their baking soda micellar water which is great for those with combination skin. This product will get rid of dirt and makeup without excessively drying out your skin. The difference between these micellar waters and others on the market is their higher concentration of micellar cleansing agents, which means they're more effective at getting in their and removing any crap that could block pores and cause breakouts. They also come in regular and mini sizes - prefect for travelling or taking with you while at a festival. My skin has no excuse to be dry this summer thanks to this delivery from Jergens - four full-sized bottles of their new oil-infused moistures. With four different types in the range, each helps to make your skin feel and look hydrated, smooth and glowy depending on your skin type - they also all smell amazing and are super easy to work into the skin. The Nourishing Honey works best for normal to dry skin and is infused with honey and orange blossom essence to help give your skin 24 hour moisture. The Hydrating Coconut is also great for normal to dry skin and contains coconut oil and coconut water to give your skin an instant hydration boost (perfect for after the beach or shower). The Deep Restoring Argan is better for extra dry skin, with moroccan argan oil and Vitamin E to give your skin a intense hydration infusion. Lastly, the Enriching Shea Butter is great for dry and dull skin as the combination of pure African Shea Butter and oils will give a deep hydration and glow to the skin. I didn't even recognise this as Dermalogica at first with the colourful packaging, but I do love the different direction they've taken wiht their newest products. As the name suggests, this masks aims to tackle your blackheads in kind of a fun way.When you first apply the product it comes out as a cream formula which you put on congested areas you want to target (always the T-zone for me). You then leave it for about five minutes and the product will begin to fizz up on your face so it looks like you have a little bubble bath on your face before you remove with a warm cloth. A nice quick mask if you don't have a lot of time on your hands and would also would be pretty fun to do with a bunch of friends. This is some strong stuff, both in power and smell. This product aims to really fight away those blemishes or acne. This aims to tackle breakouts in just 15 minutes and while I wouldn't say it will be completely gone within that time, if it's quite red or inflamed this will help to bring it down. I use this as a spot treatment as my breakouts aren't to bad these days, but if you have more severe skin blemishes you can apply a thin layer to the entirety of your face - just be sure to test for any irritation on a small patch of skin before you go doing that. We've finally reached the last round of products! Skinstitut generously sent me a complete set of their products and I have been impressed with their stuff in the past and know many people who also love to use them - in fact my old housemate use to use this cleanser. If you have sensitive skin this IS NOT for you, but for other skin types who want something that is going to give their skin a good clean, that won't completely break the bank and is easily accessible (usually from your local pharmacy) this is a good place to start. With 12% Glycolic acid, tea tree oil and d-panthenol, this can be used daily to help decongest your skin and give it a deep cleanse. I've had this product in my bathroom before and I love using this stuff. This product isn't intensely hydrating so you will still need something else on hand for after you apply this, but I find it helps to maintain an even skin tone and improves the overall look and feel of my skin. This is a nice and light weight moisturiser that is perfect for the day time. It sinks into the skin nice and quickly and has a soft floral scent to it (perfect for the upcoming summer months). It dries with a more matte finish so its also great for under your makeup. Last but not least, Skinstiut's Repair Balm - if you have real dry and cracking skin or have just undergone a chemical peel, cosmetic tattooing or micodermaabrasion, this is what you need handy in your cupboard. As you would guess by the name, the formula is a bit thicker than your regular moisturiser, but I still find it super easy to apply. When I apply this on my regular skin it leaves a bit of an oiler finish, which always a sign to me of something with intense hydration. This isn't something that I could use on the regular, but with the laser treatments and eyebrow microbalding I've had in the past, is still something I'd keep handy.